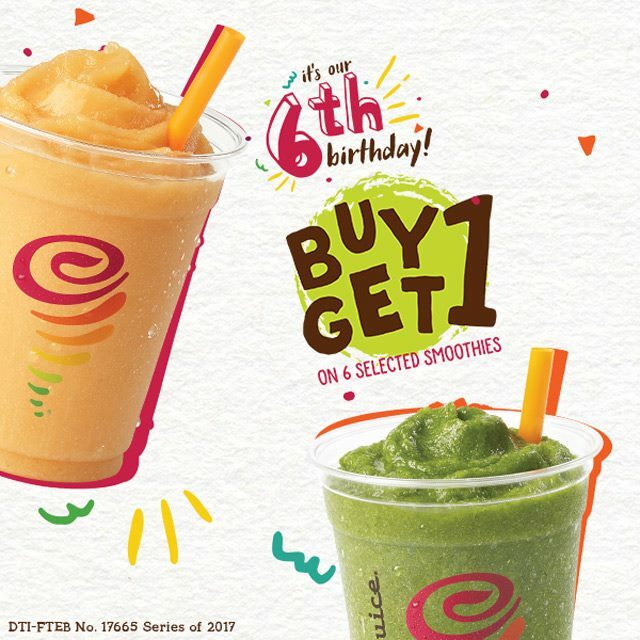 Jamba Juice is turning 6 today 11.11 with a berry special Buy1 Get1 Anniversary Promo! Buy a 16oz of any one of the following smoothies and get another 16oz one from the same list - FOR FREE! Promo runs on November 11, 2017, from store opening until 6 PM only. • Free smoothie must be of equal or lesser value than the purchased smoothie. a. Guest can claim past 6:00PM of November 11, 2017 only if they have shared the Official Birthday Post of Jamba Juice Philipines’ Facebook Fanpage. b. Guest must show their profile newsfeed with the shared post to claim." • Promotion can be claimed at Yellow Cab Collaboration stores in Shangri-la, Taft, and Dasmariñas. • Not to be used in conjunction with other promos and discounts. • In the purchase of goods and services which are on promotional discount, the senior citizen can avail of the promotional discount or the discount provided herein, which ever is higher.